The Gran Turismo Vision concept may be the first time in history an actual car has been built only for use in a video game. Unless Activsion made cinder-block racecars for the Atari Grand Prix cartridge. The result is futuristic, inspired by heritage, and absolutely stunning. What If 8-Bit Racing Cars Were Rendered In 3D? The car has classic sports-car proportions, but wildly exaggerated — improbably low, a long, long hood, and a rear so short and pert you feel pervy just looking at it. 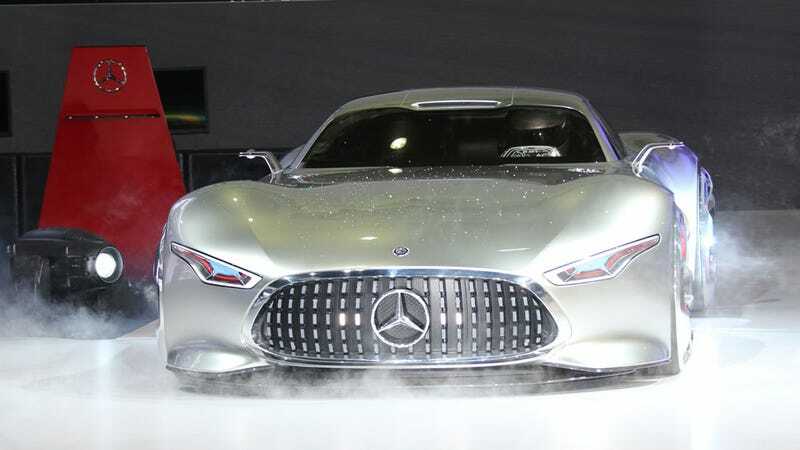 The grille is a standout detail — it's patterned after heritage Benz racecars like the 300 SL, but is made of a grid of widely-spaced LED lights in a matrix that can display animations and patterns. It sounds cheesy on paper, but in practice it's very striking and adds a lot of dynamism to the car even when it's still. I saw patterns that suggested, of course, the Knight Rider roving-eye thing, and also ones that seemed to suggest vintage driving lights and grille bars. It's pretty damn cool. The rear also has some fantastic light treatments, with a long, unbroken red taillight pipe belting the rear, bisecting the delightfully Tron-bonkers array of eight exhuast exits. The car will end up in the game, of course, and while it's not clear just how drivable the car actually is, it's amazing to see something that looks like a 3D rendered fantasy in the real world. UPDATE: Ok, there were certainly many cars that came before that were made exclusively for video games.